The most flexible custom installations are controlled from a centrally located A/V system rack usually found in remote locations of the home or office. At the very least, this includes the ability to select and distribute an audio source to any zone in the system and play it back at a desired volume level. 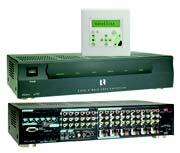 The best of these systems can distribute several sources to multiple zones, at different volume levels, simultaneously. Until recently most of these systems have been unaffordable to most. Russound has created products that offer sophistication, fidelity and value, offering a product for every budget. If you are getting pricing on the net read this first?